About six years ago... when I was working at Wex Photographic as a busy Ecommerce Director I had the opportunity to learn all about photo-books. Thing is, it was peripheral to what I was doing and I knew it would require a fair bit of an investment on my behalf to get my head around it all. Given that I had young children I thought I would spare the time to have a go by making a photo-book of my growing family. Looking back now, I can see that it wasn't really much of a stretch and the result has become a deeply treasured family artifact. Here's my story and it's why I think that photo-books are the future. I'm a reasonably tech friendly kind of guy, family generally look at me to renew the anti-virus software, operate the Amazon prime thing or design the kids party invitations. But it's true to say that I don't exactly enjoy all this shenanigans, it's a bit like work and in my spare time I would rather be catching some morning sunlight with my camera or cycling across the south downs, or throwing my kids around a swimming pool or anything apart from sitting in front of a computer. I was typically cash rich and time poor so the invitation to invest hours into making a photo-book was first met with horror. I knew it could mean hours of fiddling around, downloading software and laying out pictures and captions and generally getting anxious about something else that I really did need to do. I took the plunge anyway, I told myself it would be necessary research for my work. I loaded the software and to my surprise, there was very little fooling about with this. Then I started painstakingly laying out the pages. Being a bit of a perfectionist I was still disappointed with the results even after 3 hours of intense concentration. So I stopped and took a different approach. I started again, this time I thought what the heck, I will let the software do all the work. I threw all my pictures at it and clicked the buttons like crazy: make me a book, some mugs, a key ring and a few other bits and pieces.... I basically let the software do everything. This took only a few minutes and while I felt that the result was far from perfect, I really had run out of time so I just hit the big green order now button and went off to find something else to make a mess of. About a week later my creative experiment arrived in the post. To my complete surprise, my family really liked it... no they loved it, instantly! Despite the fact that a computer decided which photos to use and where to put them. I didn't make much of it at the time, it looked a bit gimmicky to me and I quickly released the photo-book into the kids play things. Then I noticed over the years how the book had been on hand at any opportunity to show a visitor what someone looked like as a baby and so on. It's now really well worn, its dog eared, pages have been sellotaped back in, the spaces have been scribbled in and it's riddled with coffee mark stains. Thing is, it is honestly the only thing that the family still has from that time that is enjoyed more and more each time it comes out. The photo-book has truly become a legendary document of our family at the time. Over the years I broke up with the kids mum, they started school, I got a new job... life went on but the book still exists and delights each one of us with the memories contained in its scruffy pages. It may well have cost thirty or forty quid if I had of actually paid for it, but I can put my hand on my heart here and say it is priceless to my family and to me. This is why I am getting ready to make another photo-book this year and why I can recommend that you do to. Don't worry about laying out perfectly balanced pages or choosing the perfect photographs for each page, don't even worry if the design looks cheesy, or the colour is all wrong. This is not a book to keep pristine and safely away from grubby fingers, that would be missing the point. It's a book to be part of the fabric of your life. In very short time it will become a personal and cherished family best-seller. 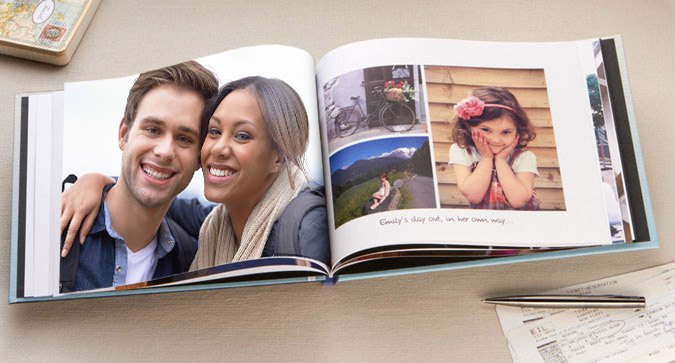 Twenty minutes of your time and forty quid at PhotoBox... Unbelievable value!